Olympique Lyonnais, or Olympique Lyon, had its golden era in the beginning of the millennium winning seven consecutive league titles – the longest streak in any of the biggest football leagues in Europe, in the first decade of this century and a time during which the words “Lyon” and “Gerland” (their old stadium) were practically synonymous to “French football”. Lyon's new stadium, Parc Olympique Lyonnais, June 2016. Olympique Lyonnais were founded in 1950, but the year is half-deceiving, given that the club can trace its origins back to the 19th century, and more specifically to Lyon Olympique Universitaire, which can be seen as a very early predecessor of the club that was meant to take French football by storm a whole century later. The fifties passed with “OL” earning promotion to the top division and then establishing themselves as a consistent participant there. The sixties were the decade that Lyon had to up their level, and they did exactly that, earning their first Coupe de France in 1964 with French-Argentinian Néstor Combin scoring twice in the final against Bordeaux. Three years later they repeated their success, with Fleury Di Nallo scoring in the final one of the 222 goals he netted for Lyon throughout his career, many more than any other player who has worn Lyon's jersey. The sixties were also the first decade that Olympique Lyonnais made their name heard at international level. Despite losing to Monaco in the Coupe de France final in 1963, they represented France in the 1963-64 Cup Winners' Cup edition, because Monaco won the double, leaving a European birth free for Lyon. The same season OL lifted their first major trophy in that Cup final against Bordeaux, they also made it to the Cup Winners' Cup semifinals, where it took later-crowned winners Sporting CP three games to beat Lyon. The first game in France ended in a goalless draw, the return leg as well had no winner (1-1), so the teams had to meet for a third time, in neutral Madrid, where finally Lyon fell to the Portuguese side. Lyon's biggest success in the seventies was winning the Coupe de France for a third time in 1973. This time it was the turn of another Lyon great, Bernard Lacombe, to score one of the goals that led OL to the win in the final against Nantes. The best they managed in the nineties was to finish second in 1995, but Aulas kept on dreaming and investing, and finally, in 2002, he saw his team reach glory, winning their first Ligue 1 title. Next time France had a new champion, it was an incredible seven whole years later, with Lyon dominating the national football scene until 2008, when they won their seventh consecutive Championship. They celebrated their unprecedented and practically impossible to repeat (let alone break) record, by winning the double that season, beating PSG in the Coupe de France final, with a Sidney Govou goal in extra-time. Ironically, Lyon's second big success in a UEFA competition, a spot in Champions League's semifinals, came after their dominance in Ligue 1 was over. In the 2009-2010 season, not having won the Championship for the first time in eight years, they had to start their European journey in the play-off round, where they ridiculed Anderlecht by scoring a total of eight goals in the two games against them. Finishing second in their group, behind Fiorentina and ahead of Liverpool, they were drawn against Real Madrid in the round of 16. Against all odds, it was they who qualified to the quarterfinals, where they wrote another golden page in their history by eliminating Ligue 1 champions Bordeaux. Only Bayern Munich proved too good for Lyon in that season's Champions League, beating OL twice in the semifinals, both in France and Germany. The starting team againt Rennes may 23, 2015. In 2012, Lyon celebrated their fifth Coupe de France title. Ever since then, they have not managed to add more silverware to their collection, but they remain in France's elite, a status they will never lose, not after the way they dominated the national football scene for years, becoming a force to be reckoned with at international level as well. The fact that in January 2016 they got into their whole new and massively impressive stadium, Parc Olympique Lyonnais, gives them hope to return to where they got used to seeing themselves the first decade of this century. Today's logo has been in use since 2006, and is a modernized version of the one that had been used since 1996. The initials OL (obviously initials for "Olympique Lyonnais"), and a lion (a major symbol of the city of Lyon, present in both its flag and coat of arms), have been included in all logos since the club's founding in 1950, excluding the period between 1989 and 1996 when the lion was missing. 1896 Lyon Olympique Universitaire is founded (this marks the start of the club's prehistory). 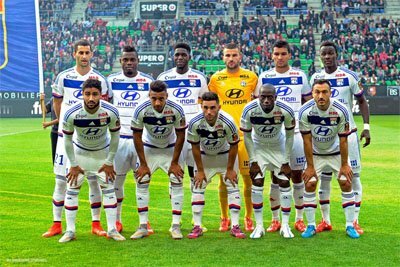 1950 The football club Olympique Lyonnais is founded. 1964 Winning its first Coupe de France trophy. 1987 The French businessman Jean-Michel Aulas become the new club owner. 2001 Winning its first Coupe de la Ligue. 2002 First time Ligue 1 champions. 2016 Moving to Parc Olympique Lyonnais. 2009-10 Semi-finals Eliminated by Bayern M.